In an entry for a 1950 collection catalogue of the Société Anonyme, the artist Marcel Duchamp wrote: “In tracing his lines with ruler and compass, [Vasily] Kandinsky opened to the spectator a new way of looking at painting . . . a clear transfer of thought on canvas. This has been the real contribution of Kandinsky towards a conception of esthetics.” These laudatory words easily apply to Circles in a Circle, in which geometric forms and subtle color harmonies combine to make an effervescent, abstract composition. Through the Société Anonyme, an art organization led by American collector Katherine Dreier and designed to generate awareness of modern art, Duchamp helped to secure Kandinsky’s first solo exhibition in this country. Circles in a Circle demonstrates Kandinsky's distinctive style from the early 1920s, when he began teaching at the Bauhaus in Weimar, Germany, and subsequently moved away from a spontaneous painting style to a geometric composition. In this work, a thick black circle surrounds twenty-six overlapping circles of varying sizes and colors, many of them intersected by straight black lines. Two strobes of blue and yellow extending from the top corners cross toward the center of the piece, changing the colors of the circles where they overlap. 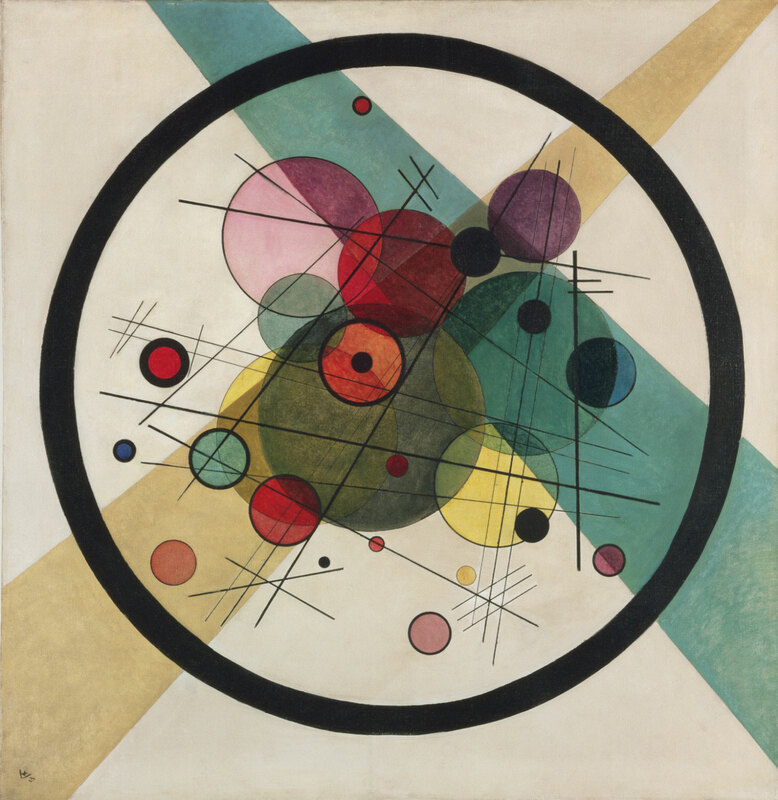 Although Circles in a Circle is distinctly different from Kandinsky's paintings of the beginning years of the twentieth century, it reflects his continued belief that certain colors and shapes signify emotions that can be codified and combined into a whole, reflecting the harmony of the cosmos. For Kandinsky, the circle, the most elementary of forms, had symbolic, cosmic significance. He wrote that "the circle is the synthesis of the greatest oppositions. It combines the concentric and the excentric in a single form, and in balance. "1 In a letter of 1931, he described Circles in a Circle as "the first picture of mine to bring the theme of circles to the foreground. "2 Emily Hage, from Masterpieces from the Philadelphia Museum of Art: Impressionism and Modern Art (2007), p. 136. 1) Kandinsky, as translated in Will Grohmann, Wassily Kandinksy: Life and Work, trans. Norbert Guterman (New York: Harry N. Abrams, 1958), p. 188. 2) Kandinsky to Galka Scheyer, Dessau, May 9, 1931, as translated in Amy Baker Sandback, "Blue Hights Drive," Artforum 28, no. 7 (March 1990), p. 127.